A technology coming later this year from a startup called Bromium will secure computers not by blocking them off from suspect data and applications but by isolating anything untrusted from the core of the OS. Bromium's technology, built around its Bromium Microvisor software, uses hardware virtualization capabilities in the Intel x86 architecture but doesn't create virtual machines, which Bromium says degrade the user experience and can't truly solve the problem anyway. Instead, the Microvisor creates what Bromium calls Micro-VMs, which run just one task instead of an entire OS instance. Bromium CTO Simon Crosby at the GigaOM event. Bromium will take a fundamentally different approach to security compared with most systems, said Simon Crosby, its co-founder and chief technology officer, who introduced the company at the GigaOM Structure conference in San Francisco on Wednesday. Trying to protect users from anything unknown in the outside world hurts productivity, because employees need to reach outside their enterprise networks to get their jobs done, Crosby said. "Today, IT can only raise the walls higher, like the ancient city of Troy," Crosby said. That's an endless battle, because it's inevitable that users will download malicious or faulty code, he said. "We are gullible, and programmers are fallible." Bromium takes the fight inside the system instead. It can address both items that are suspect themselves and ones that may be legitimate but vulnerable to attack. When a user goes to a website or downloads an application or piece of content that may not be trustworthy, the Microvisor creates a Micro-VM and puts that code in it. 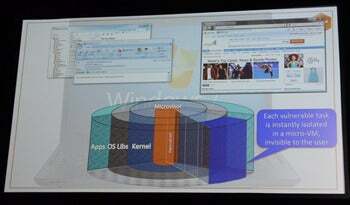 It can create 100 Micro-VMs in a second, one for each task that wants to run and each tab in a browser, Crosby said. For example, the Microvisor could create a Micro-VM specifically for a secure Web session on a consumer's banking site, which would isolate the password entry from any keyloggers that might reside on the PC, Crosby said. Micro-VMs are invisible to the user, and a downloaded application such as an "Angry Birds" game on an enterprise PC could permanently run within a Micro-VM without affecting performance, he said. As shown in a slide displayed at the GigaOM Structure conference in San Francisco, the Bromium Microvisor creates a Micro-VM for each vulnerable task that isolates it from the rest of the system. The Micro-VM provides only the resources that the task needs, such as a spreadsheet or a Facebook cookie file. 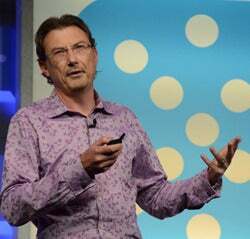 "The world that is presented to a Micro-VM is precisely what it needs to know," Crosby said. The untrusted code doesn't have access to any of the other applications or files on the system, nor to the core elements of the OS. If it needs to modify any part of the OS in order to run, the Microvisor copies that component inside the Micro-VM. The OS itself is never changed. By keeping untrusted code away from the system as a whole, Bromium can shrink the target for attackers to address, Crosby said. This cuts down on the lines of code where they could look for vulnerabilities to exploit. Whereas an OS may be 100 million lines of code, the Bromium Microvisor has only 100,000 lines and the "vulnerability face" between a Micro-VM and the overall system is only 10,000 lines, he said. Crosby, a former Citrix and XenSource executive, introduced Bromium in stealth mode at last year's Structure conference and used this year's event to lay out some details of its technology. The Silicon Valley company plans to start by offering its technology for client systems in public-sector organizations and other enterprises that are regulated, such as law firms, Crosby said in an interview following his presentation. The technology can run on any x86-based system and could be applied to servers, too, he said. When the ARM chip architecture gains hardware virtualization capability around the end of this year, Bromium might be able to move there, too, according to Crosby. That would open up most of the mobile device world.